Pyrrole is a five-membered aromatic heterocycle with the formula C4H5N (or C4H4NH). Is an electron-rich species, considering that shows 6 π electrons on 5 p orbitals (that's like saying 6 π electrons on 5 atoms). Each carbon partecipate with a single π electron, therefore 4 in total, while nitrogen atom provides two electrons ( a lone pair ). Considering that nitrogen provides two electrons for the aromaticity of the molecule, it doesn't behave like a base, accepting protons. Obviously isn't a basic species, as maybe we could think if we wouldn't observed carefully the structure. This feature is fundamental to understand the reactivity of this compound. Acid - base properties of pyrrole are closely related to the reactivity, and that's why we should pay a specific attention on it. Which is the more stable "tautomer"? In the blue box is shown the more stable tautomeric form, or rather the one with the greatest degree of delocalization of the positive charge. If you understand why the -2 position is the more likely to accept a proton, then you'll surely understand part of the reactivity towards electrophiles. The most commonly used base to remove a proton from pyrrole's nitrogen atom is the hydride, that's a must have in every chemical lab. Let's have a look to different groups of reaction that can generally involve pyrrole. We said from the beginning that pyrrole is an electron rich species. In a way the heterocycle can therefore behave as a nucleophile. This obviously means that is extremely reactive towards electrophilic species, often too much reactive, considering that's extremely difficult to have just one position substituted. In the scheme, there are three common pyrrole's reaction. First of all, considering that pyrrole is electron - rich can react even with very weak electrophiles, reactions that benzene would not absolutely give. That's what happen, for example, in the reaction with molecular bromine (Br2). 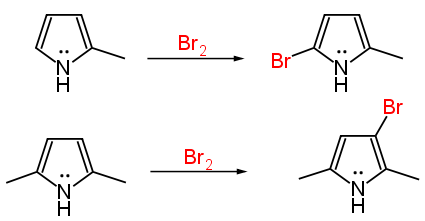 In order to attach the substituent -Br on a benzene ring would have been necessary, ie to activate bromine with a Lewis acid (the problem with pyrrole is instead that the real product is a tetra-substituted pyrrole). The other two reactions are respectively a Friedel - Kraft acylation and alkylation. As it is correctly shown in the Friedel - Kraft alkylation reaction, is likely to have pyrrole reacting with more than one electrophile molecule. In addition, the alkyl group is an activating group itself. Is a bit different the acylation reaction, considering that the acyl group is a deactivating group ("takes off" electron density from the ring). Anyway we're going to see that even in this specific case is possible to insert another electrophile group on the ring without paricular difficulties. Another question that may come to your mind is: on which position do the electrophiles center? If we have a look to the map of electron density we notiche that this (the electron density) is not that different from carbon to carbon. As we said previously (above), pyrrole as base is a very good example to understand its reactivity as nucleophile. The only difference is the electrophilic species. When pyrrole act as a base the electrophile is H+ (E+): if we pay attention that paragraph suggested us that substitution reactions go through carbocationic intermediates, and therefore electrophiles will attach on the position that correspond to the most stabilized carbocations (this may help you → carbocations stability). In the pyrrole molecule -2 and -5 positions ( they are the same, the molecule is symmetric) allows the best delocalization (mesomeric effect) of the positive charge. In the example is clear how the positions for the entrance of the nucleophile are preferentially -2 and -5. If this position are already occupied, the electrophile easily goes to -3 and -4 positions. As said before, pyrrole is for sure not basic. If we put pyrrole under extremely acid condition (approximately -4) we can obtain the protonated species (really high energy intermediate) for the time necessary to react as an electrophile with another molecule of pyrrole. The result is a polymer named "polypyrrole" or "pyrrole black", that is an organic conducting polymer, or more precisely a semiconductor (conduct electrical current only in one direction).